That is the only word that can describe many of the career academies available in St. Johns County schools. Career academies provide smaller learning environments where students are involved in hands-on, real-world projects. Areas of study span from banking to architecture, information technology to biology. On Friday, Chancellor Rod Duckworth and I traveled with Dr. Joe Joyner to a handful of the district’s career academies, witnessing the excitement and innovation of participating students. I thought I had seen just about everything when students from Bartram Trails High School unveiled their sculpture created from more than 200 recycled bottles. Not to be outdone, both Ponte Vedra and St. Augustine high schools featured similar project-based learning exercises. My next stop at Ponte Vedra High School’s Academy of Biotechnical and Medical Research was definitely an eye-opening look into the meticulous science of biology. While watching each student don safety goggles and handle delicate lab equipment, I felt like an extra on the set of CSI. The school also features another career academy focused on international business marketing, with quite an impressive computer lab. There I met a wonderful young lady set on becoming more computer proficient than Floridians twice her age. 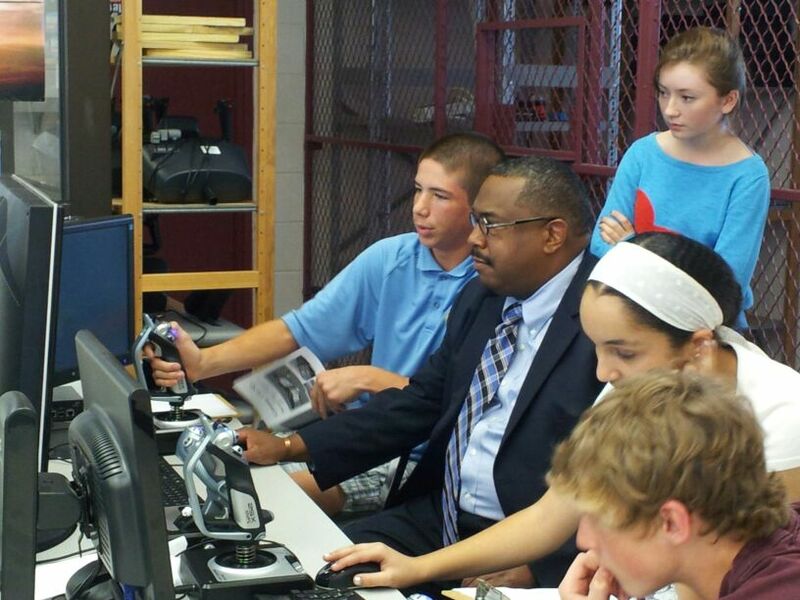 Chancellor Rod Duckworth works with students from the St. Johns Aerospace Academy at St. Augustine High School. My last stop for the day was the St. Johns Aerospace Academy and St. Johns Academy of Future Teachers at St. Augustine High School. I can tell you there is no greater joy than watching young people develop skill sets to make their dreams come true. And, meeting with so many aspiring teachers, it certainly felt like these programs had come full circle. 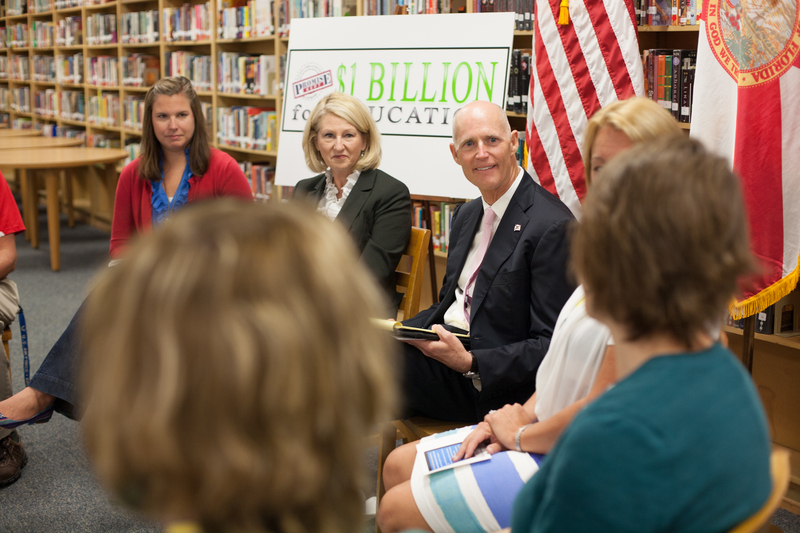 I’ve always felt that my passion for education began years before I started teaching in Florida’s public schools at Ward-Highlands Elementary in 1981. In fact, even my personal life is deeply connected to education issues, as the mother and mother-in-law of two outstanding teachers and grandmother of two elementary school students. While in St. Johns County on Friday, I wasn’t just visiting local students, teachers and parents as the Commissioner of Education. I was reunited with them as a friend and colleague. Before joining the Department of Education as Chancellor of Schools last year, I served as the St. Johns County Deputy Superintendent. A few weeks ago, Superintendent of St. Johns County schools, Dr. Joseph Joyner, invited Chancellor of Workforce Education Rod Duckworth and me on a tour of innovative programs and career academies at area schools. 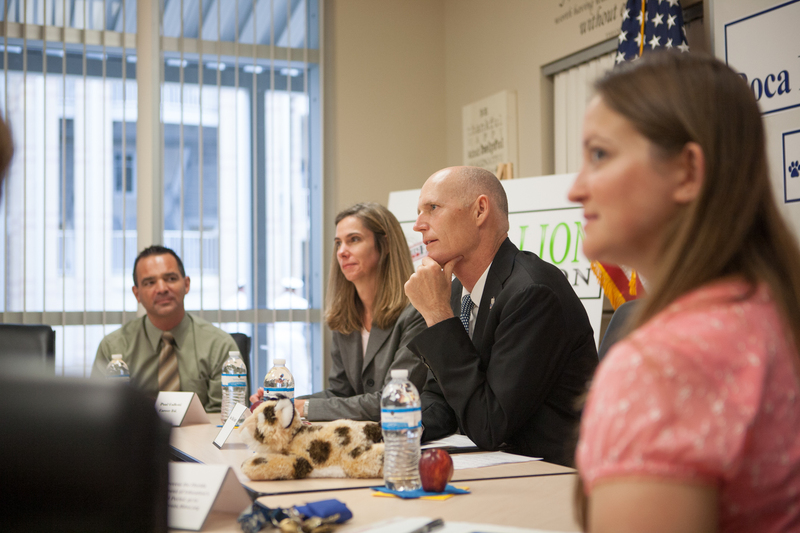 I was delighted to meet with so many educators employing new ways to meet the needs of today’s students. Friday morning, I met with officials at Bartram Trails High School where students from the Academy of Design and Construction unveiled their new “green” project. The large tree sculpture they had planted in the school’s courtyard was “green” in more ways than one. The sculpture was created from the ingenuity of 11 career academy students and more than 200 recycled plastic bottles. It was wonderful to watch these students share their passion for architecture and project-based learning. Bartram Trails is not a stranger to student-led, hands-on projects. In 2005, the school partnered with VyStar Credit Union to provide a student bank, fostering financial literacy and business leadership. Another blog will be on its way this week detailing other exciting programs I visited in St. Johns County.